For their second release, Scott and Renae of Wolf of the Willows opted to play around with a historic beer style. They took a saison, a style becoming increasingly popular in Australia, and gave it a contemporary twist in the form of a heap of hops. 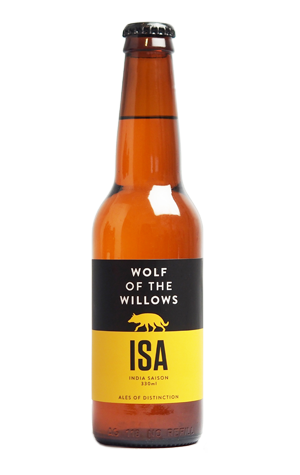 They come in the tri-nation form of Mosaic and Citra (both US), Ella (Aus) and Nelson Sauvin (NZ) and create a tropical hit atop the spiciness provided by the Belgian yeast as well as the rye malt. Yes, it's not just the use of lashings of New World hops that make it different to your average saison: there's rye as well as oats in the mix, adding both a touch of flavour and a fuller body, while the saison yeast pokes through in a peppery fashion from the background.